Shutaf (“partner” in Hebrew) operates three day camps during school vacations – one-week camps during Hanukkah (winter) and Pesach (spring), and a three-week camp in August. Shutaf's innovation is the creation of a new model of inclusion where the majority of children (75%) have diverse developmental issues together with a minority group (25%) of typically-developing children. The program is geared to the needs of children with special needs first while still being a program that can be enjoyed by their typically-developing peers. 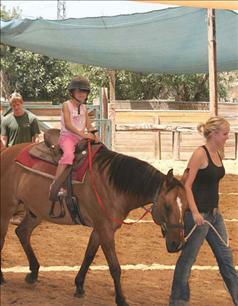 Camp activities include therapeutic programs, in music, drama, movement, dance, arts and crafts, horseback riding, aquatics, grape-picking, olive-pressing, hiking, animal husbandry and physical-sensory activities. Shutaf trains and hires ten young adults with special needs to train and work alongside an equal number of typically-developing teen volunteers as junior counselors, kitchen and maintenance workers and in the Shutaf kiosk. The Shutaf staff includes a professional camp director, psychiatric social worker, professional special education coordinator as well as several specialty counselors and therapists. In addition, Shutaf has a devoted staff of counselors who undergo intensive training workshops before camp sessions. Children with special needs cannot easily integrate into existing afternoon classes and summer camps since they require a significantly higher level of structure and assistance in informal social settings. The traditional model of inclusion often leaves children with special needs behind, both socially and educationally. Inclusion programs do not easily adapt to the slower pace of the special needs child creating barriers to friendships and learning, making it hard for a child to build self-esteem and a sense of belonging. The long summer vacation can be especially lonely for both children and teens who may have no program that matches their particular needs. Some teens with special needs are capable of understanding and facing the nature of their disabilities and what their futures may hold as adults. For them, their parents and families, it may be a time of emotional upheaval and distress. Typically-developing children, participate mostly in after-school and camp programs that are costly and highly goal oriented, catering to parents’ ever-increasing demands for “enrichment”. For them, Shutaf is an oasis away from over-crowded schools and the over-scheduled life of the modern-day child. Shutaf’s relaxed, outdoor camp atmosphere fosters an environment of social awareness and change through the development of healthy and caring friendships. Shutaf, for children and young adults with special needs is committed to inclusion-based programming that answers the social, educational and vocational needs of our community. We believe in camp for all, regardless of disability and financial limitations. Our program creates new opportunities for children and young adults of all religious backgrounds to come together, learning important Jewish values of acceptance and understanding. 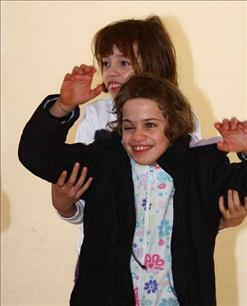 Shutaf’s inclusion model of 75% children with special needs and 25% typically developing children is entirely unique in Israel and possibly in many other countries as well. In addition, Shutaf’s founders and camp director come from an American camping background, where educational and values-based content infuse the program. 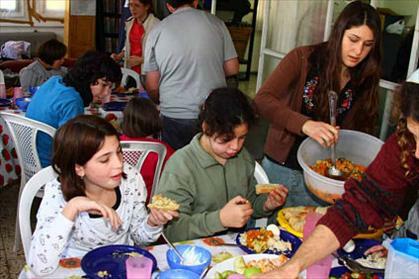 The camping culture in Israel generally attends to the parents’ need for their children to be occupied and cared for by providing activities that pass the time. Shutaf aims to educate and nurture our campers, staff and volunteers, promoting values of inclusion, acceptance and enjoyment together. Shutaf provides true respite for parents by providing a quality program where parents feel secure in knowing their child is well-cared for and having positive experiences in a relaxed and accepting environment. Offering scholarships beyond Shutaf’s highly subsidized tuition fees, we are committed to making camp possible for every child regardless of financial need or disability. As an example of our mission to accept “hard-to-place” children, Shutaf was pleased to accept Sivan, a child with active epilepsy, into its camp program. Sivan’s mother had never before encountered a program that would accept her, taking responsibility for her unique needs. Shutaf hired an additional counselor who learned the necessary procedures for caring for Sivan in the event of a seizure and was in physical proximity to the child at all times. At a later date, we were happy to accept Sivan’s younger sister, offering the siblings a rare opportunity to enjoy a fun camp experience together. Sivan’s mother feels truly indebted to Shutaf for having made such a positive impact on her family. Shutaf models diversity and Jewish values, serving families from all backgrounds and levels of observance. With a high percentage of observant staff members, Shutaf enables Jewish observance in a non-coercive manner for its campers. Shutaf responds to the needs of a much-neglected population in Jerusalem. The children, teens and young adults with special needs involved in our program have limited options for educational frameworks and few, if any quality after-school activities. Many are not recognized by the National Insurance Institute as having mild retardation, severe learning disabilities or other challenges that impede their ability to function in competitive, mainstream educational or employment settings. This exacerbates families’ sense of isolation at a time when many are coping with dysfunction and poverty caused by unemployment, multiple disabilities in the family, as well as limited resources and education. Shutaf is creating a community of connection and motivation amongst families of children with special needs. We are modeling a new kind of co-existence, creating a special place of learning, of core Jewish values, important social values and enjoyable times together. Ofir, a Shutaf Teen with Special Needs: Shutaf’s Bogrim/Young Adult program is offering Ofir new hope for a successful future. Ofir, who is 18, has significant learning disabilities. He recently transferred from an inclusion setting to a special education school where he’s finally made good friends. Still, after-school activities remain hard to come by for the good-looking, blue-eyed boy. His mom Sigalit, reports that Shutaf’s program and training opportunities have helped Ofir blossom in new ways . Now an experienced staffer with Shutaf, Ofir works as a paid junior counselor at camp. Ofir’s work is prized by the professional staff at Shutaf - they respect his work ethic and effectiveness with the campers. “Ofir is talented and focused,” reports Shutaf educational supervisor, Melina Natinson. “The children love him.” Ofir even made a personal donation to Shutaf and can’t wait to take part in Shutaf’s planned youth movement program to debut in the spring of ’09. Creating new social and employment opportunities for young adults with special needs is an important part of Shutaf’s mission. For Ofir, the real success is being valued as an integral part of the staff, receiving a paycheck and learning new skills – life is good. Chason, aShutaf Camper: Chason jumps out of bed each morning at the crack of dawn. He’s up, singing happily and ready for the new day. Whether it’s school or camp, life in Jerusalem suits him just fine. 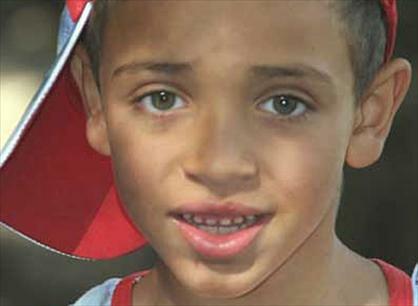 Chason moved to Israel when he was 5 years old to live with his maternal grandparents, Nechama and Gary. They have weathered the job of parenting an active seven-year-old with Autism Spectrum Disorder at a time of their life when they might have been pursuing retirement activities. Shutaf camp gives Chason the active, structured day that works well for his high-energy approach to life and offers his grandparents a break from the fatigue of managing his needs on a daily basis. Gary commented that Chason has a deep, “inner need to be with kids yet struggles to communicate and make friends.” Shutaf offers Chason mediated, social interactions that enable him to feel accepted. The counselors work skillfully with Chason, displaying an easy affection that maximizes his enjoyment at camp. This past Chanukah ‘08 was probably Chason’s favorite camp experience. Ami Yares, his head counselor, forged a wonderful connection with him and assisted him with finding appropriate ways to express his feelings, especially when language, one of Chason’s challenges, deserted him. Gary reports that Chason has also benefited from Shutaf’s inclusion model. “Associating with kids who cope with more significant challenges as well as typical kids gives him new perspective” into his own issues. Being outdoors, meeting new children, having great counselors and a fun program of activities - Chason can hardly wait for Shutaf’s next camp. Shutaf is a dynamic, energetic, young organization that inspires its participants, staff and donors alike. Our innovative and caring approach alleviates the pressing needs of children with special needs and their families, teaching socialization skills, Jewish values, acceptance and mutual respect. We actively seek ways to connect with communities in Israel and abroad in creative and mutually-satisfying ways. 1. Spend time with Shutaf campers both in camp and during the course of a visit in Israel. 2. Pair with a Shutaf child of similar age for your bar/bat mitzvah. 3. Correspond with a Shutaf camper through JChoice.org. 60 children from Jerusalem and its surrounding areas (75% with developmental issues, 25% typically developing children). Shutaf is a place where you don't always know who has special needs and who doesn't - emphasizing kids’ similarities, not their differences. so important. I just volunteered for the Special Olympics in my town and I can tell you first hand, this type of program makes a difference!